The Supreme Court nominee leaves some ‘hypothetical’ questions unanswered. WASHINGTON — Supreme Court nominee Brett Kavanaugh presented himself to the Senate and the American public Wednesday as an independent judge with an open mind, refusing to be pinned down on legal questions involving investigations of President Trump and how his presence on the court might shift its ideology to the right. 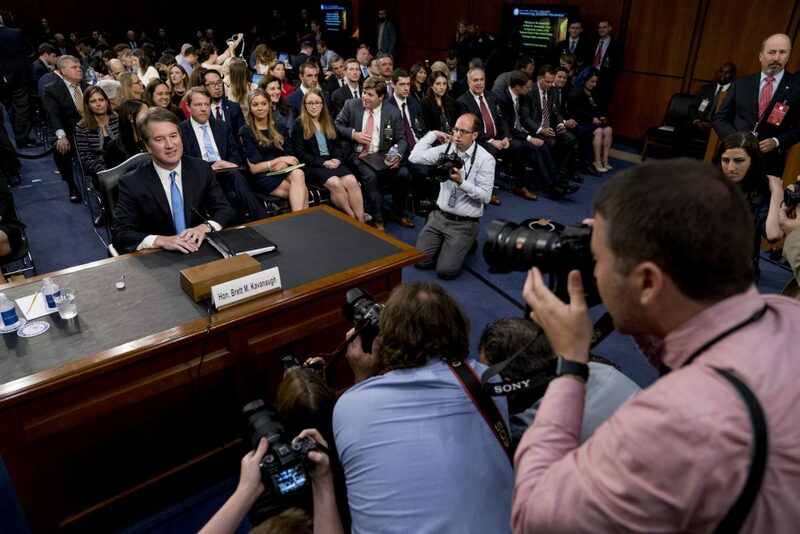 Kavanaugh, 53, a judge on the U.S. Court of Appeals for the District of Circuit, proved to be an amiable and collected witness during a marathon day of questioning and dozens of interruptions from screaming protesters, who were quickly escorted outside the committee room by Capitol police. Kavanaugh displayed an extensive knowledge of constitutional law and a debater’s sense of sparring with Democratic senators who oppose his confirmation. At times, he used his gift of gab to avoid direct and pointed questions. “You’re learning to filibuster,” said Sen. Dianne Feinstein of California, the ranking Democrat on the Senate Judiciary Committee. “I think all I can say, senator, is that was my view in 1998,” Kavanaugh responded. All are issues crucial to special counsel Robert Mueller III’s investigation of Russian interference in the 2016 election and possible coordination with associates of Trump, the man who chose Kavanaugh to replace Anthony Kennedy, the court’s pivotal justice. Likewise, Kavanaugh turned aside questions on abortion, gun rights and how Congress might get around some of the Supreme Court’s rulings on campaign finance restrictions. That said, Kavanaugh searched for ways to try to convince Democratic senators that they should not fear his confirmation. “I understand the – the importance that people attach to the Roe v. Wade decision, to the Planned Parenthood v. Casey decision,” Kavanaugh told Feinstein, referring to the Supreme Court’s precedents guaranteeing women’s right to abortion. While Kavanaugh was reluctant to talk specifics about executive power, he was eager to dispense with the view – which he himself raised in a roundtable discussion with other lawyers published in 1999 – that a major decision involving presidential power was wrongly decided. Without being asked, Kavanaugh brought up U.S. v. Nixon, the Supreme Court’s unanimous 1974 decision that said President Richard Nixon had to turn over tapes of White House conversations. “One of the greatest moments in American judicial history,” Kavanaugh said of the decision. He did not mention his comments in the roundtable discussion. Observers pointed out that Kavanaugh endorsed some Supreme Court precedents, while demurring on others. Republican senators on the committee, all of whom are expected to support Kavanaugh’s confirmation, set him up to show his independence and to illuminate his life as a husband and father, who coaches his daughters’ sports teams and feeds the homeless. Supreme Court nominee Brett Kavanaugh testifies before the Senate Judiciary Committee on Wednesday, the second day of his confirmation hearing to replace retired Justice Anthony Kennedy. Kavanaugh briefly choked up as Sen. Lindsey Graham, R-S.C., asked about his personal life, including his work serving meals with Catholic charities. “Describe the difference between Brett Kavanaugh the man and Brett Kavanaugh the judge,” Graham advised. Trump said Kavanaugh was turning in a winning performance. Even though the president did not add Kavanaugh to his list of potential Supreme Court nominees until its third iteration, he said Kavanaugh was “born” for the job. Democrats pushed Kavanaugh on gun control, campaign finance restrictions, whether the nominee was honest with senators in the past and on what they consider the right most endangered by a changing Supreme Court, the right to abortion. On Roe, Kavanaugh said the high court has affirmed the ruling many times, but he would not go further to say it was correctly decided. That the Supreme Court considered and rejected overturning Roe gave it extra weight, he said. Feinstein, who earlier cited hundreds of thousands of women who had died due to illegal abortions in the years before Roe, appeared unpersuaded. “How you make a judgment on these issues is really important to our vote as to whether to support you or not because I don’t want to go back to those death tolls,” she said. “And I understand your point of view on that, senator, and I understand how passionate and how deeply people feel about this issue,” Kavanaugh responded. Some antiabortion activists are convinced Kavanaugh will help form a majority on the court to overturn the precedent; they are going door-to-door in some states asking voters to pressure their senators into supporting Kavanaugh. The judge also defended his dissent in a recent case that allowed an immigrant teen in federal custody to end her pregnancy. Kavanaugh emphasized that the teen’s age was critical to his opinion, which would have allowed the Trump administration to, at least in the short term, continue to block the girl’s abortion. He noted that the Supreme Court has upheld parental-consent laws that can lead to delays. The judge’s dissent in the case said his colleagues had created a new right to “abortion on demand,” and Sen. Richard Blumenthal, D-Conn., said that was to send a political message and boost the judge’s profile as a potential high-court nominee. Democrats also pressed Kavanaugh about the basis of his dissent in a 2011 ruling that upheld the District of Columbia’s ban on semiautomatic rifles. Kavanaugh said he was following Supreme Court precedent in a landmark 2008 decision that declared an individual right to gun ownership. Semiautomatic rifles, he said, are widely possessed throughout the country and therefore cannot be banned, according to the high court’s ruling. Kavanaugh has acknowledged he is in the minority of judges who have considered the issue. Kavanaugh also faced numerous contentious questions from Democrats about his expansive views on presidential power, which has been documented in panel discussions and law review articles. In the 1990s, Kavanaugh was a member of independent counsel Kenneth Starr’s team investigating President Bill Clinton. 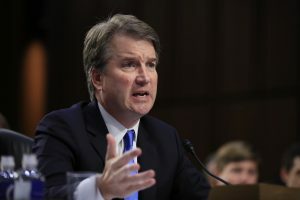 After subsequently serving in the Bush White House in the aftermath of the Sept. 11 terrorist attacks, Kavanaugh said he came to believe that sitting presidents should not be distracted by criminal investigations or civil lawsuits. Kavanaugh said he was not arguing that it was unlawful to investigate the president, but that Congress might want to protect the president from such injuries and lawsuits. Blumenthal tried to elicit a commitment from Kavanaugh to recuse himself from any Supreme Court cases involving President Trump’s potential criminal or civil liability. Blumenthal suggested it would be a conflict of interest for Kavanaugh to rule in a case directly affecting the man who nominated him to the high court.